In my earlier post, I showed photos of a rock structure whose purpose was unknown to me. In response to the photos, I received an email from one of the residents. I know about the rock pile. If you walk along the earth dam you can see several spots where water has overflowed that dam during high water events, erosion causing gouges and potentially breaches. 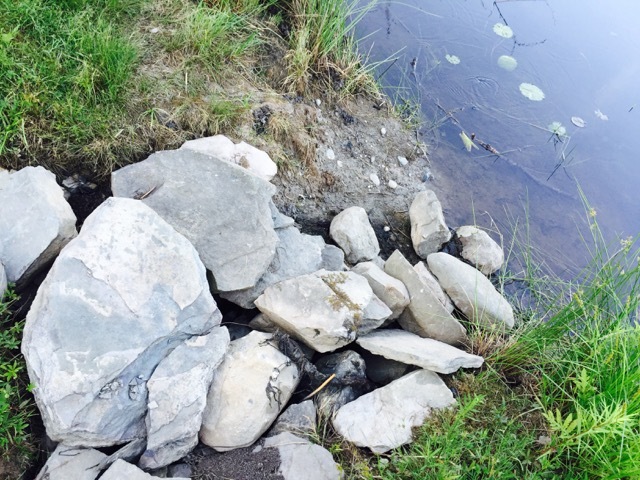 The hole filled with rocks is lower, larger and deeper than the others, having been helped along by boaters for the convenience of easier access. My neighbors put down the rock in hopes of reinforcing that weakness. It’s my thinking that preventing damage to the earth dam is one of several reasons why discovering a more reliable method for regulating the water level is a good idea, along with damage to Pond Rd, … and the stability of the ecosystem. With this explanation, I now know how wrong I was. This finding was humbling and inspiring. I am extremely grateful to this resident for sharing this story. I have a feeling there are many more.